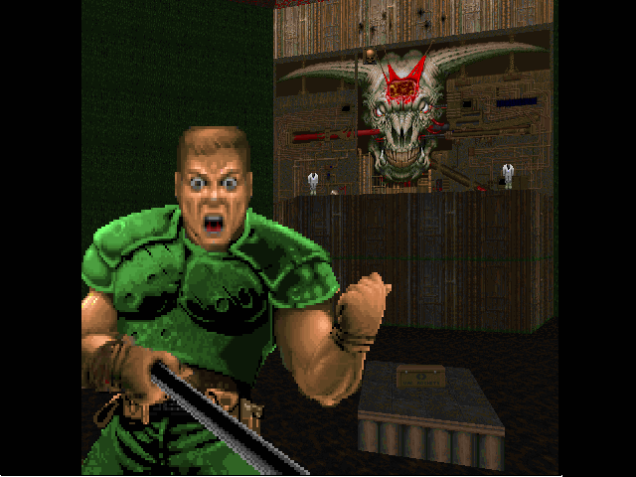 id software was known for releasing the code for their engines (not maps) under the GPL some years after a game's release... basically all the games from Wolf3D to Doom 3. They've been ported to pretty much everything for this reason. If you want to prove you have graphics working on your modded camera, console, or whatever, porting an id engine is the standard test. I recall a few years ago loading Rockbox (open source MP3 firmware) onto my Sansa player and it was able to play Doom. Not very easily considering control placement and the small screen size, but the game itself ran perfectly. A time of shareware games with no micro transactions. Truly, simpler times. many modern games dont want longevity. most of the cod releases for example could have just been community created free mods. the "zombie dlc" that people buy is actually a fan created free mod in counteratrike. by locking fans out they can squeeze more money out of them. the companies dont want players modding old games as it prevents them from needing to buy the newest and "best" games out there. Another reason: it was easy to mod. Its data came as a single large file, the IWAD. You can think of it as somewhat similar to an uncompressed ZIP file. That file contained several objects: each map was one object, each texture was one object, and so on. But there was also the PWAD (Patch WAD). It had the same structure as the IWAD, and there was a command line parameter to pass the filename of a PWAD to load. Each object loaded from the PWAD replaced the object with the same name from the IWAD. So a PWAD could for instance replace any of the maps (its most common use, to make custom maps); it could replace textures (normally used in conjunction with custom maps); and so on. Anything which wasn't replaced by the PWAD was loaded from the IWAD. This made it easy to produce and distribute custom maps. Use a level editor to create the map, write it on a small PWAD (being small was important, this was the time of dialup modems), and it could be easily loaded without modifying any of the game files. There were a few limitations of the format (for instance, to replace one specific type of texture you had to replace all textures of that type), and there were things it couldn't change (which were hardcoded into the executable), but it could do a lot. Even before the source code was released, even before executable editors for the game, there was already a healthy modding community for Doom. All thanks to the PWAD mechanism. Oh man, Descent was my childhood. Seems weird to say but Descent 3 was the first game I was ever exposed to. I was ecstatic when they rereleased the Descent games on steam sometime last year. > Another reason: it was easy to mod. And because it was the only practical way to view a 3D world at the time. The "professional" 3D packages were extremely expensive (thousands of dollars) and had steep hardware requirements, while Doom was free (shareware) and ran on commodity PCs. It wasn't just the best or easiest-to-mod FPS of the time, it was the only one (excluding Wolfenstein which didn't really use a Z axis). If you wanted to build a 3D model of your high school—extremely common given that so many of the modders were boys in high-school—there wasn't much else. Doom was easy to mod, all your friends already had the viewer, and you could sneak it into the computer lab for networked play. The doom modding community is dead. They only create useless mods that act more as if the game has been broken. All whilst killing the legacy of what otherwise was a great game. Oh I do hope the selfie stick fires like the BFG. If so it must be awesome to have a glimpse of that thrilled look while you mass destruct everything in your path. many modern games dont want longevity. most of the cod releases for example could have just been community created free mods. This is, of course, the problem with the theory that modding is "good for games". Certainly it's good for gamers, so yes, it's probably good for "games". On the other hand it's kryptonite for most game companies. Let's face it, most of the major game companies prefer to recycle the same (usually) crap game as many times as they can possibly get away with, repeatedly polishing the same turd to squeeze out another £40 a time from it with "new" releases. Playing into the modding culture would not only kill that "money for old rope" business plan, but would require the games to have gameplay with an appeal lasting beyond a few 10's of hours, which is a pretty rare commodity in games. Can't see that happening somehow... be nice if a company gave a flying f*ck about it's customers, though, wouldn't it? The S.T.A.L.K.E.R. series should have been mentioned. Ever since the dissolving GSC, all of the 3 STALKER games have had large mod communities!